Welcome to my first Murderous Mondays post! I’m joining some cozy mystery blogger buddies for this fun weekly link-up. We’ll be sharing our recent and/or favorite murderous reads. Bree at Bibliophile Reviews and Marie at A Cozy Experience are also posting for Murderous Monday. Be sure to stop over and check out their posts! Hopefully, you’ll find some great suggestions to add to your TBR pile and wish lists. Also, be sure to comment below and let me know what murderous mystery books you are reading! 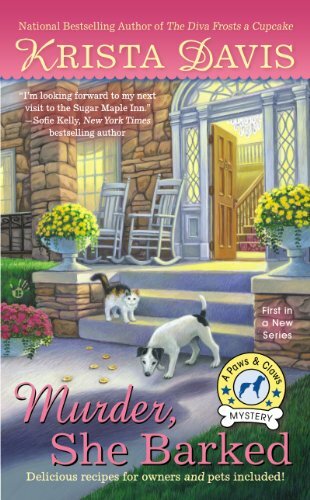 I recently read Murder, She Barked by Krista Davis. This is the first book in the Paws and Claws Mystery series. I really loved it and am excited to read more in this series. And, as a bonus…there was even more than one murder and crime in this book! 🙂 Since this was a 5-star read for me, it is the first book I am featuring for Murderous Mondays! Holly Miller’s life has gone to the dogs. She has no job, her boyfriend’s former flame is sniffing around, and a scruffy but loveable Jack Russell Terrier is scattering crumbs all over her borrowed car. Just when she thought things couldn’t get worse, a troubling phone call about her grandmother sends her rushing home to the family inn on Wagtail Mountain. Delicious recipes for owners and pets included! I enjoyed reading this first-in-a-series cozy mystery from author Krista Davis. I purchased it for my Kindle a couple of years ago and I’m so glad I finally made time to fit it into my reading schedule. Holly finds herself heading back to Wagtail, Virginia, to help her grandmother (Oma). After murders and some unsolved crimes, Wagtail, a premier pet town, is feeling uneasy. Wagtail sounds like the perfect town, and I would love to stay at the Sugar Maple Inn with Oma and Holly. The mystery kept me guessing, as I tried to figure out just how the crimes were connected and who could be the guilty culprit. I am looking forward to my next visit to Wagtail. If you like cozy mysteries with a smart female sleuth, LOTS of pets, and an endearing town, look no further than Murder, She Barked. Pick up your copy from Amazon. Let me know…have you read any of the books in this fun series?